It takes a village to raise a child. 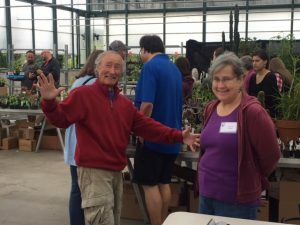 It also takes a village to put on a tremendously successful plant sale. Our club is small compared to some of the clubs located in more succulent friendly climates. What we lack in numbers we make up for in passion and energy. With a turnout of eight excited members, we transformed the donated commercial space into our own cactus and succulent store. A big shout out here to Sky Nursery in Shoreline, WA for continuing to support our sale as they have for somewhere over 28 years. We filled our ten large horticultural tables with a selection of large and small succulents in a variety of forms: dish gardens, bonsai, Halloween jack o’ lanterns, outdoor succulent gardens, cute pots, etc. There was really something for everyone, Except Lithops lovers. Those were lacking. There will be a Lithops growing push in our club’s future. Saturday morning we were greeted by a line of shoppers outside the store, waiting to head for our sale space in a frightening imitation of salmon spawning upstream. (A sight familiar to us in the Northwest.) Crowds continued until 3:30 p.m., allowing our checkout team to get a break for the first time. We were “dazed and amazed” with the succulent fever that consumed the shoppers. 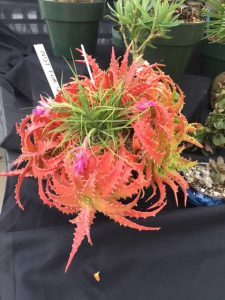 One of the best things about the sale each year is that we see our fellow cactophiles who live in the area (some people drove three hours to come to the sale). Our local popular gardening expert, Ciscoe Morris, spent time before his radio show doing some shopping. Once their shopping cart or box is full, there is time to catch up and hear about their collection. Some things heard this year: Go LED, use Milk of Magnesia to remove spines, Kalanchloe ‘Mother of Millions’ toxify the soil and nothing will grow near them, growing things in extremely small pots helps prevent overwatering, and other such tidbits. We also learned that no matter how much promo you do, people primarily use our website and Facebook to find out about the sale. By the time the dust settled at the end of sale day on Saturday we surveyed tables nearly empty with few boxes left. Sellers scurried home to prepare more plants for sale on Sunday, and one member went dumpster diving at two local businesses for boxes. Shout outs here to Trader Joe’s and Mudbay, (a local natural petfood store) for helping out a desperate woman babbling about succulents and boxes. We had another banner day on Sunday, the Seahawks opening season game not dampening any shopping enthusiasm. We left Sky Nursery’s space as we found it, empty, and went home with a full cash register and three well used Square Up card readers. One quit working and we thought it might possibly have melted from continual use. Show plant on the display table. As for the initially mentioned village, we had a team of 5 checkout folks who operated as a finally tuned machine, 14 vendors who spent long hours growing and preparing plants for sale then talking to over two hundred shoppers, a staunch greeter and plant show guard who interrupted several attempts to remove show plants for purchase, rovers who assisted shoppers with boxes, questions and shared information about our club. The coordinators spent hours planning just so that when things went awry, it really didn’t matter. The sale happened, customers got exciting new plants and our club has program funds for the coming year. We feel happy.